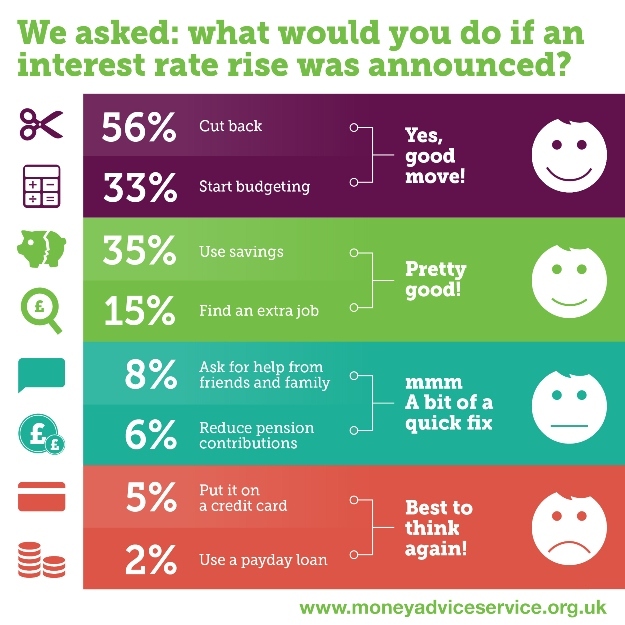 A rise in interest rates may be looming on the horizon, but research from the Money Advice Service shows more than half of UK homeowners are not prepared for the impact. Just one in four homeowners have considered how they'll cope if interest rates were to rise by three per cent. This might sound reasonable, since the base rate has been wallowing at half a per cent since March 2009. But given Bank of England governor Mark Carney has announced he expects rate to rise by up to three per cent within the next three years, it's increasingly likely homeowners will have to prepare for some more financial pressure, even if the impact is gradual. An increase of up to three per cent could well see many people facing a hike in their monthly repayments of up to £150, something 47 per cent of homeowners would struggle to cover. For 19 per cent of people, any increase would leave them really struggling. And more than a quarter don't know what their current mortgage interest rate is. Fortunately, there are some things we can all do now to limit the impact of rate rises. Here are four that could make all the difference. Use a mortgage calculator to see what different rises in interest rates will mean for you if you're on a variable or tracker mortgage. When you click through to the calculator, enter the amount you have left to pay on your mortgage in the price of property box, then put a zero in the deposit box. Next, use the slider to arrive at the number of years you have left to pay and start changing the interest rate. While it's highly unlikely that rates will leap up two or three per cent, this exercise will at least give you a clearer picture of what you may need to cover in a few years time. It makes sense to take action as soon as possible by reviewing your finances and making changes. Cutting back now may not be a welcome thought, but is definitely better than trying to do so when interest rates rise. After all, if you overestimate interest-rate increases, it just means you have more money saved, which can be put to good use elsewhere. A budget planner is a useful tool to use here, as it will give you an overview of your finances, allowing you to identify ways to reduce your outgoings and so build up your savings. If you have some savings, you could consider making mortgage overpayments, if your lender will allow this. This will reduce the lump sum you owe, meaning you'll pay less in interest, which could prove very worthwhile if rates rise. To give an example of what difference overpayments could make, consider the following. If you overpay £100 a month on a £120,000, 25-year mortgage charging four per cent interest, you would save £15,000 in interest payments and reduce your mortgage term by five years. If you want more information on overpaying, see the Money Advice Service video. Depending on how long your current mortgage has to run, it may be worth switching to a new deal. This would be particularly attractive if you're able to fix at a lower rate, which could compensate for any early-exit penalties. Also, remember that if your home has increased in value your loan-to-value ratio will probably have increased. This means you could end up paying lower rates.